Interview with religion and mythology scholar Acharya S. (D.M. Murdock) examines the effects of early Christianity on other religions of the time. I walked away from listening to this interview thinking Acharya has become to much head and not enough heart. I'm intrigued why Miss Murdock chose this title. It evidently obvious that Acharya.S is well educated on a range of religious cultures spanning back centuries and I would imagine a conversation with this lady would be fascinating, I am also interested in buying the book mentioned in the interview that claims to unveil Krsna, Buddha. and Jesus. That should make an intriguing read. I understood how Murdock finds similarities between this religious culture and that religious culture and claims one has taken concepts and adopted them from another, and in conclusion the ideas of Christianity are not original but adopted from a previous movement. This on the surface seems to undermine the authenticity of the power of religion, How can it be genuine when it stole the idea from another movement which predates it.? This to me is not the most accurate way to view the purpose of religion. The purpose of religion is to bring one closer to God, regardless of the religion, it is to learn and know and to understand God. That is what religion means. What this means is, That God is the only independent being, God does not depend on anything to exist, God is self sufficient in energy, That is the nature of God, everything else that is brought into existence is through God, nothing exists independently or outside God. Therefore the conclusion is that everything that exists is an expansion of Gods energy. But does this mean that everything automatically becomes God?, No, it just means everything is an expansion of Gods plenary portions or external energy, An example can be given of the sun and the sunshine, using a purport from the Bhagavad Gita. As the sun exists diffusing its unlimited rays, so does the Supersoul, or Supreme Personality of Godhead. He exists in His all-pervading form, and in Him exist all the individual living entities, beginning from the first great teacher, Brahma, down to the small ants. There are unlimited heads, legs, hands and eyes, and unlimited living entities. All are existing in and on the Supersoul. Therefore the Supersoul is all-pervading. The Lord is situated in everyone's heart as the Supersoul. Does that mean that He has become divided? No. Actually, He is one. The example is given of the sun: The sun, at the meridian, is situated in its place. But if one goes for five thousand miles in all directions and asks, "Where is the sun?" everyone will say that it is shining on his head. In the Vedic literature this example is given to show that although He is undivided, He is situated as if divided. From this we can conclude that the sunshine is everywhere and is an extension of the sun, Yet the sun globe exists in a single spot, Both are the same in chemical qualitative attributes and are non different from each other but yet both are different. For example both the sun and sunshine are part of the same reality, but there is a great difference between having a beam of sunshine in your room, and being in close proximity to the sun itself. This philosophy is called Acintya Bheda-Abheda, which means the inconceivable oneness and difference of the Lord. He is one with his creation by expansion of energy yet different at the same time. The goal of every religion is to reach God realization, and to awaken our spiritual relationship with God, There are many paths this is an accepted theology according to the Vedic school of thought under Gaudiya Vaishnavism. I am only giving my understanding here and by no means do I intend to undermine Achrya.S or her work, I am just offering my understanding at how to create unity in diversity. Everything is from a single source God, although things appear different they are from the one source. I also look forward to buying the book Sons of God: Krishna, Buddha, and Christ Unveiled. Every time I listen to an interview I think this could be my favourite one, but I certainly think this interview is up their with the best. I didn't re-listen to the interview, but from what I remember she appears to be a defusionist meaning myths are just made up stories, bad explanations or cons that are ONLY disseminated from culture to culture through causal means - as opposed to the Jungian idea that they emanate from “deep structures” in the collective unconscious and their themes, images and motifs can arise spontaneosly in distant cultures and their meaning requires a hermeneutic approach as one would analyze or interpret a dream (“myths being the dreams of cultures”). Her reductionist view I find shallow and unappealing and very much akin to Alex's view of materialism. yeah, she's done some amazing research. I can't quite figure out why she has so many haters. please refrain from posting in this thread. 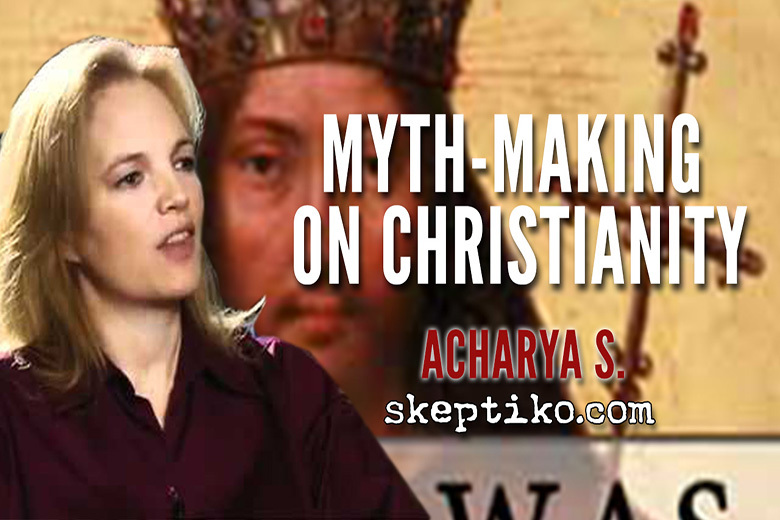 Most of the things Acharya had to say was interesting and she raised some good points, like Christianity adopting exact concepts from religions that pre-date Christianity, concluding some ideas of Christianity are not authentic, like similar stories of theifs on a cross, and the Nazarenes being a type of carpenters Freemasonry, which maybe imposed their influence on the scriptures. I'd like to buy the books and investigate this stuff. My only quibble would be that Acharya said she intentionally absorbed herself in certain practices to explore their validity, and it seems to me she came up blank, and regards the religions as myth. Whereas I would say, firstly, you can not test God, you either genuinely and sincerely want to know God, but intentionally testing God is not the best way, secondly, sacred texts are frameworks which if followed rightly demand you to move on from the mundane philosophical approach to looking for truth by philosophical speculation and to live by faith in the things you know as good. In other words, if we believe in talking snakes then there is no need to read further, right there you should give up and no need for a long scholarship to disprove Christianity, but nobody believes in a talking snake, people believe in the framework it gives us to approach God and try to do his will, which we evidently and inherently know, is good. And without religion we can never know that. And without religion we can never know that. To many, religion has been an additional obstacle impeding progress, rather than a way forward. Each to his or her own, if someone finds something useful, then stay with it. Impeding progress? There is no progress for an individual who does not know God. It's impossible to know God without religion, religion means knowing and doing the will of God. On a tangent - with that strong belief why is it that you support the writings of one who attacks religion? Is it that , like most religious people, as long as those attacks aren't directed at the religion you practice it's all good? As I said each to his/her own. I'm not criticising your beliefs, but the way in which you express it here represents a very limited and narrow perspective on a very broad subject. I suggest you might try being less prescriptive and allow that there are other ways of viewing the subject. No problem, I'm just sharing my view, I understand there are opposing views. Acharya criticised a range of religions including Vedic literature but I'm not offended because they are just her views, I listened to the interview and concluded her profession as a religious scholar has allowed her to gather a wealth of knowledge and her claims should be worthy of investigation, as well as interest. I also gave some of my own criticism, for what it's worth, probably two cents. Kudos on that. Why then do you take offense when posters here criticize religion much less harshly than she does? I think I get your point and mostly agree. it's also interesting to look at it from the other direction... i.e. if you believe the reality of talking snakes is something that would totally and completely shatter your worldview... and you could never trust the reality of it even if you had a 100 people you totally trust tell you they had experienced a talking snakes... then, you really don't need to do any testing/research. I'm not sure what you mean, but I did offer my criticism in this thread on Achraya classing religion as myth. Although that seems the obvious outlook I think she needs to go deeper, but not intentionally as a mental gymnastic test but sincerely and genuinely surrender your own mental concoctions and then realise the ultimate truth through devotion and a living philosophy rather than a speculative philosophical one, which is a preliminary step in spiritual understanding. I expect someone of her calibre to know that. Political and professional fame cannot last forever, but a conscience void of offense before God and man is an inheritance for eternity. Religion, therefore, is a necessary and indispensable element in any human character. There is no living without it. Religion is the tie that connects man with his Creator," and holds him to his throne. If that tie is broken or sundered, he floats away a worthless atom in the universe, its proper attractions all gone, its destiny thwarted, and its whole future nothing but darkness, desolation and death. A man with no sense of religious duty is he whom the scriptures describe in so terse and terrific a manner, as "living without hope and without God in the world." Such a man is out of his proper being, out of the circle of all his duties, out of the circle of all his happiness, and away, far, far away from the purposes of his creation. " Okay. Let's go with that. I realized that Alex might be pissed by my posting in this thread mostly because they aren't discussing the topic itself. So having already expressed my opinion I'll keep any other posts here on-topic. My on-topic, personal attack free response. My work is not Atheistic, per se, in that I’m just trying to debunk the concept of God or gods. That shows an immediate bias. It is different than someone "investigating the concept." Having a debunk/assert agenda will lead one to focus mostly on the things that support that agenda. That’s what religions try to do. There’s a lot of mind control, right? They threaten you with Hell and promise you Heaven if you think a certain way. This concept of mind control is taken to an even greater extent by claiming that there’s a giant being called God who is separate and apart from humanity but omniscient so He’s really inside your head. Not all religions have a heaven and hell. And most religions are focused on one's action not one's thinking. Also a "separate God" would obviously not be "inside the head." And how does that have anything to do with "mind control." Mind control isn't "do xy and you get a reward" it's taking away functional choice so that the person isn't aware of anything other than xy. It seems that she is very influenced by a materialist/brain-centric viewpoint. The very notion of "the privacy of one's own mind" is - in these areas we speak of - in opposition to a unified primary consciousness. It’s important because the blind following of that ideology, in this case Christianity, has caused immense suffering. So when we say Christianity has brought this and that and this and that, you might be able to find a few seeds in the bag of dog poo but you might as well just go buy a big bag of seeds instead of trying to pick through the other. This is opinion masquerading as scholarship. The idea that Christianity (or any religion) has caused suffering is a common and fallacious argument. The "Gods of War" by Meic Pearse is a good summation of those fallacies. People inflict sffering on themselves and each othere. They've used any available means to justify that - religion, science, nationality, race, philosophy. There are those who use "religion is bad" to inflict suffering on each other. Much more to go but I'll pause here.